The Rev-A-Shelf-Two Tier "drop -in" Rolling Tray System is a versatile way to better utilize and increase space in your drawers. Eliminate the wiggle factor found in other manufacturers poorly designed tray organizers. This unique tray set comes in a variety of sizes and depths which can be trimmed that perfect custom fit. Features a removable top rolling tray. The Rev-A-Shelf-Two Tier "drop -in" Rolling Tray System is a versatile way to better utilize and increase space in your drawers. Eliminate the wiggle factor found in other manufacturers poorly designed tray organizers. This unique tray set comes in a variety of sizes and depths which can be trimmed for that perfect custom fit. Features a removable top rolling tray. Available for both shallow and deep drawers. 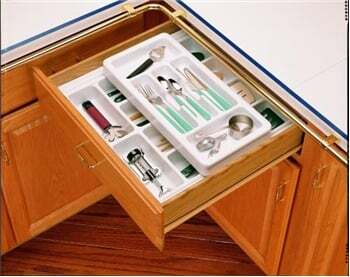 Shallow Rolling Tray System - Meets virtually any drawer storage and organization requirement. Thick guage polystyrene with high gloss finish. Top-rack dishwasher safe. Two-Tier Cutlery Tray made of heavy polystyrene with a high-gloss finish. 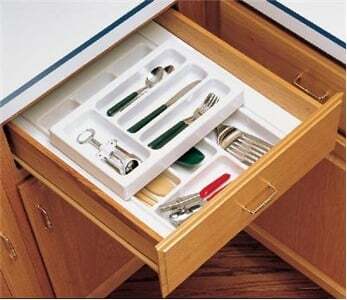 Meets virtually any drawer storage and organization requirement. Top-rack dishwasher safe. 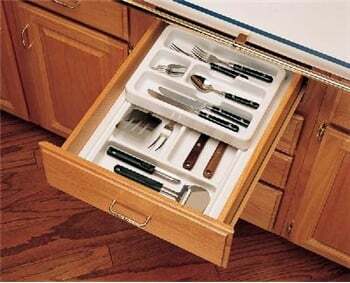 Fits every kitchen drawer. Meets virtually any storage and organization requirement. Thick guage polystyrene with high gloss finish. Top-rack dishwasher safe. 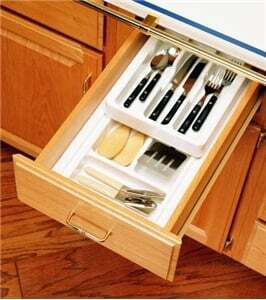 Our Rolling Tray System program offers a complete collection of tray kits that fit virtually any kitchen drawer & organization needed. They are made of heavy gauge polystyrene with a high-gloss finish & are top-rack dishwasher safe. Deep Two-Tier Cutlery Tray made of heavy polystyrene with a high-gloss finish. 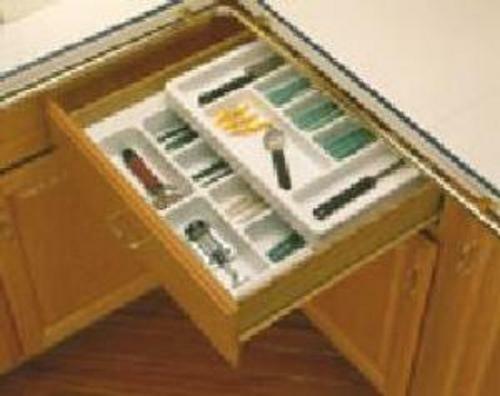 Meets virtually any drawer storage and organization requirement. Top-rack dishwasher safe.